This article is a quintessence of my all experience I’ve got for last years working as a computer vision consultant. I hope you will find this interesting and useful. My goal was to create set of rules I follow personally on daily basis. Mark all input data with const modifier to specify immutable arguments. Prefer return by reference for large objects (especially for images) instead returning by value. In case of class methods, mark methods that does not change class internal state with const modifier. These simple advice helps to understand what and when can you function change. You may remember tricky details of your code today, but who guarantees you’ll easily remember that in a month? If the algorithm needs to preserve state between calls - use class; otherwise - use function. You may argue - with classes we can define various implementations for TemplateMatching using SIDM, CUDA or use template matching in Fourier domain. Yes, we can. But the price we pay for each call of virtual method is too big for such small routine as template matching. Usually we use TemplateMatching on small patches like 11x11 pixels to track translation between two frames of video. Hence to achieve robust tracking, number of patches can be quite high - 500 and even 1000 per one frame. Further, coarse-to-fine matching and sub-pixel optimization can lead to ten or more calls for the same feature. In this case, virtual call is a big no-no that will kill your application’s performance. As a rule of thumb: you *may* use virtual methods to execute big amount of work. Let's say one virtual call per frame looks totally fine. A thousand calls per frame is obviously a bad, bad idea. Process it with your algorithm. Save output data and track it in your version control system. Each time you make changes in implementation - run regression on same input data and compare results. I intentionally commented out first test case - in ideal world it should be executed only once. But sometimes it’s necessary to update ground-truth (you fixed a bug in original implementation). So you uncomment it, run tests, comment it back and check-in new ground-truth. You may use any format you like for dumping ground truth data (usually it’s some matrices, vectors or images). Personally, I prefer YAML and JSON. Just ensure when dumping floating-point numbers to specify maximum output precision. Otherwise you will have funny weekend debugging absolutely correct algorithm with failing assertion check 0.1543642342365 != 0.154364. Once written, regression tests should be run on regular basis either manually or using automated CI system of your choice. In the simplest case, it could be trivial console logging. In debug mode you will have all messages in stdout, but in release it will be totally excluded from compilation step. For complex systems I suggest to use mature logging frameworks like Boost::Log or similar. They has separation of logging streams (info, trace, warning, errors) and deal with multi-threaded logging. Logging to file is also useful feature when you want to store program output for further analysis. In one of my previous projects, there was a standalone program for logs analysis and data visualization. We logged all - matrices, vectors regular messages with timestamps. After program finishes we were able to trace program flow frame by frame and analyze how our algorithms behaved. I cannot count how much hours this tool saved to us on data analysis. Logging also helps to spot nasty bugs when you have inconsistent behavior on different platforms. For instance, not so recently I faced a problem when optical flow tracker gave different results on iOS and OSX platforms. After logging all input/output and intermediate data including vectors, matrices I found the root of the evil. It was std::log function. On OSX ``std::log(float)`` implicitly computes logarithm with double precision and returns truncated result (float). On iOS it computes logarithm using single precision leading to small difference in result. Like a butterfly effect, it affects all other parts of the algorithm. **Without logging it would be practically impossible to spot bug like this**. Algorithm performance usually a top-level priority since this kind of applications deal with real-time video processing and processing of huge amount of data. Therefore it’s crucial to know how fast your algorithms runs or do they become slower or faster with refactoring you perform. There are plenty of ways to collect this data. If you’re targeting on OSX and iOS platform, Apple Xcode and Instruments can be your first choice due to natural integration of profiling tools to IDE. Instruments can be handy to spot problematic places in your code. But Instruments uses sampling technique, which is not precise. For Windows users Visual Studio offers integrated profiler as well. Unlike Instruments, it can do instrumentation of your binary. It means each function in your program modified with special prolog and epilog code that measure execution time of all your program. Instrumenting provides you a lot of information per each routine: calls count, execution time, inclusive / exclusive CPU time, call tread and CPU cores load. This is much more you have with Apple Instruments. This partial loop unrolling gives enough information to compiler. As a result it can replace partially unrolled summation with SIMD instruction. Since compiler knows size of the array to process, it can easily generate vectorized code for this routine. The drawback of this approach is slightly increased code size if you instantiate this template function with many sizes. But you get better performance which usually worth it. Architecture-specific features like SIMD instructions can make your code runs much, much faster than generic C++ implementation. It is a must-have feature on mobile platforms since it makes your code faster and at the same time it conservate battery power of host device. There are more and more devices with CUDA and OpenCL support. And the question is - how do I manage all those possible architecture / platforms combinations of optimized functions in my code? Suppose you have a-priory knowledge that condition expression will be almost always true. Why don’t give this intrinsic knowledge to compiler? By supplying expected condition result compiler can generate more efficient code. As a result, CPU will start decoding instructions earlier. Unfortunately, this feature supported only on GCC and CLANG. But according to measurements, it can provide significant speed-up up to ~15%. You can find more information here: How much do __builtin_expect(), likely(), and unlikely() improve performance?. With only single #pragma instruction you made your code runs faster. 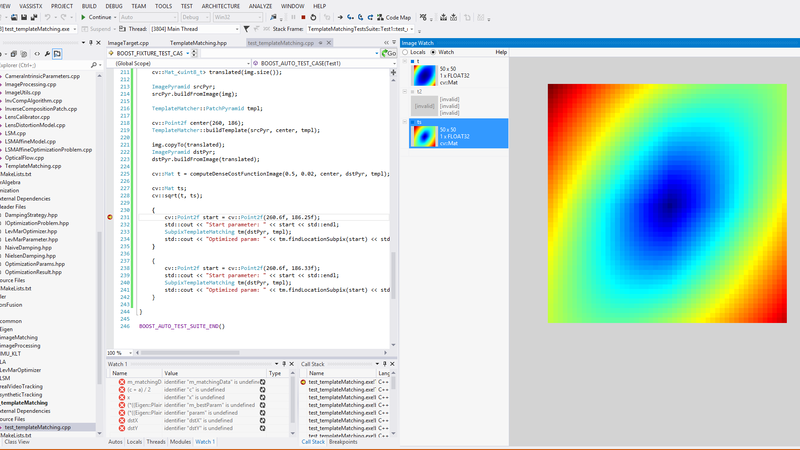 I encourage you to visit Enabling SIMD in program using OpenMP4.0 webpage for more information of supported OpenMP SIMD instructions. For Windows users there is a great Visual Studio plugin called ImageWatch that makes our life so simple. This plugin can visualize OpenCV matrices right in IDE. It is hard to overestimate the usefulness of this plugin. You can see how images are changing while debugging. Hope you found this post useful. Discussion is more than welcome. Please share your thoughts in comments.